Because we strive for excellence in every aspect of our work, we at Techni-Home feel comfortable “bragging” a little about our company, its innovative technology, and our unrelenting commitment to customer satisfaction. However, that’s just us talking, and why wouldn’t we tell you that? The real proof about who we are comes from what others are saying about us……… people who have seen and experienced first-hand our exciting technology, commitment to quality, and superior customer service. 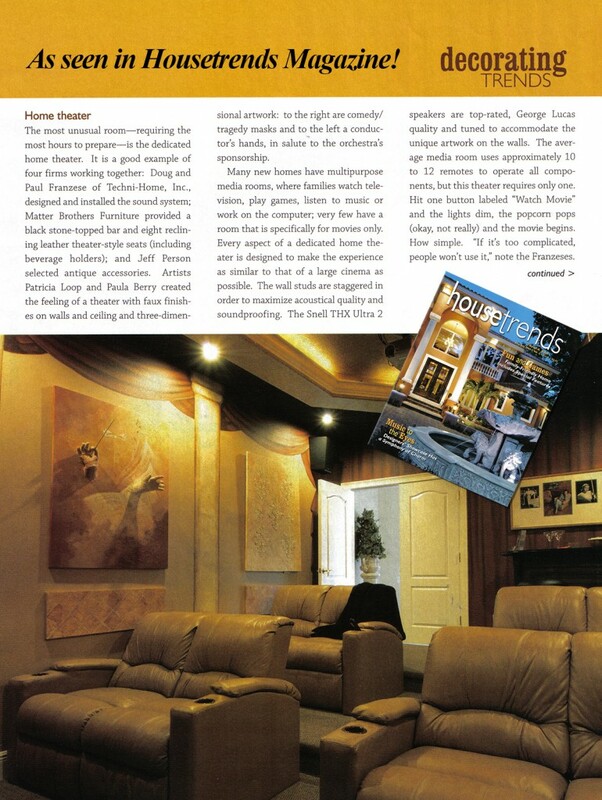 We are extremely proud to have been featured in many of the notable designer, architectural, and trade publications, as well as, showcased in the Florida Orchestra’s Designer Homes for several years. Such exposure enables us to reach discriminating clients like you – clients who are looking for the technology and craftsmanship that will enhance their homes in so many ways. ‘Interested in learning more about Techni-Home from some of our satisfied clients? The testimonials shown below more than tell us that our goal of excellence in all aspects of our work is being achieved, time and time again. And who knows? Maybe one day we will have the honor and privilege of printing YOUR testimonial! Techni-Home….Today’s resource for the home of tomorrow.